The latest unrest saw a provincial police station torched, Molotov cocktails hurled at police and tear gas fired. Riot police hold their positions near a fire after clashes with demonstrators in Tebourba, south of the Tunisian capital Tunis earlier this week. 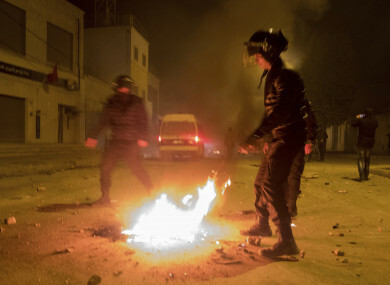 A THIRD NIGHT of unrest has shaken Tunisia where authorities said more than 600 people have been arrested this week as anger at austerity measures boils over on the streets. Police detained 328 people on Wednesday for theft, looting, arson and blocking roads, the interior ministry said, after arresting more than 280 people over the previous two days. The latest unrest saw a provincial police station torched, Molotov cocktails hurled at police and tear-gas fired, but ministry spokesman Khalifa Chibani said the “violence” was less intense than in previous days. Twenty-one members of the security forces were injured, according to Chibani, who said no civilians were hurt. AFP correspondents said most areas were calm late today, and the presidency said the main political parties, unions and business organisations will meet on Saturday to discuss the situation. Tunisia is often seen as having had a relatively smooth transition since the 2011 uprising that toppled long-time dictator Zine El Abidine Ben Ali. But Tunisians have expressed frustration since the start of the year over austerity measures expected to further increase prices in a struggling economy. The country introduced hikes in value-added tax and social contributions as part of a tough new budget. Political scientist Olfa Lamloum called the measures “the straw that breaks the camel’s back”. “Young people are disappointed with the revolution, especially because of the high cost of living,” she said. Lamloum pointed to “deepening social inequalities” highlighted by official figures showing rising poverty, unemployment and illiteracy, particularly among young people. Conflict analysts International Crisis Group (ICG) warned the country’s political class Thursday against succumbing to “authoritarian temptation”. While politicians had so far resisted the urge to backtrack on reforms, the ICG said “in the context of an economic slump, the nostalgia for a strong state, like the one that the former regime claimed to defend, is spreading”. The recent unrest started with peaceful protests last week, but escalated into clashes with police overnight Monday to Tuesday. In a third night of clashes, unrest hit several areas including the central city of Kasserine, and the northern towns of Siliana, Tebourba and Thala. In Siliana, youths threw stones and Molotov cocktails at security forces. Police responded with tear gas, an AFP correspondent said. Scuffles also broke out in some Tunis neighbourhoods. On Thursday, a few dozen unemployed people protested in the central town of Sidi Bouzid, the cradle of the protests that sparked the 2011 uprisings. In Kasserine, youths tried to block roads with burning tyres and hurled stones at police, another AFP correspondent said. The main police station in the northern town of Thala was torched, Chibani said. In Tebourba, where a man died during unrest overnight Monday-Tuesday, police fired tear gas at dozens of protesters, a resident said. At a Tebourba cafe today, 41-year-old Sami shared a coffee and a cigarette with a friend. “There’s no work and no future here,” he told AFP. I don’t have a dinar on me. One protester recalled what had happened to him. “I wanted to express my anger about being poor, and they responded with tear gas at my head,” said Mohamed Rahmani, 21, his head in bandages because of 10 stitches. Rail services were cancelled in some areas after a train was attacked in southern Tunis on Wednesday, local media reported. Activists campaigning against the austerity measures have called for a huge protest tomorrow. The opposition Popular Front party, accused by the authorities of supporting the rioters, urged the government to “find solutions for young Tunisians”. “Peaceful demonstrations are part of the democratic equation, but damaging public property and harming citizens is illegal,” said Hamma Hammami, spokesman for the leftist party. Protests are common in Tunisia in January, when people mark the anniversary of the 2011 revolution. The uprising began in December 2010 after street vendor Mohamed Bouazizi set himself on fire and later died in a protest over unemployment and police harassment. In Tebourba this evening, the mood was grim. “The political class is responsible for all this,” said teacher Fatma Ben Rezayel. The region is totally marginalised. She deplored the fact that “unemployed young people fed up with their poor lives” were being branded criminals by the authorities. Email “Over 600 people arrested in Tunisia after three nights of widespread unrest”. Feedback on “Over 600 people arrested in Tunisia after three nights of widespread unrest”.